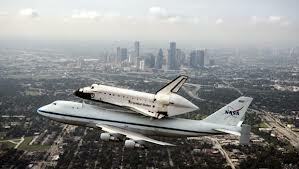 Los Angeles has a new superstar resident, the space shuttle Endeavour. And Angelenos had some exciting opportunities to see Endeavour on its historic journey to the California Science Center – the retired space shuttle’s new home. Endeavour flew right over my children’s elementary school on the last leg of its 3-day trek from Florida to Los Angeles on top of a NASA jumbo jet last month. 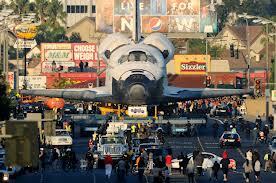 After a smooth landing, thousands watched in awe as the huge space shuttle rolled through the streets of Los Angeles on its 12 mile road trip to the museum. 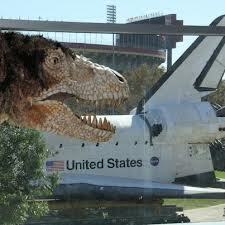 Even a few residents at the Natural History Museum came out to welcome Endeavour to the neighborhood. Within weeks of the shuttle’s arrival, the California Science Center opened the Endeavour exhibition on Tuesday, October 30. My family couldn’t wait to see the exhibition. So we jumped on the new LA Metro Expo train in Culver City and made it to California Science Center at Exposition Park in less than 20 minutes. The kids loved the adventure of it all, and my husband and I loved the free parking and traffic-free ride. We entered the new Samuel Oschin Endeavour Pavilion and couldn’t believe the sheer magnitude of the space shuttle – it’s 122 ft. long with a wingspan of 78 ft. But it was actually something rather small that eventually grabbed our attention. The shuttle is mounted fairly low to the ground so we got a close look at its well-worn exterior surface. I couldn’t help but wonder what kinds of foreign space matter created all the dents and scratches. 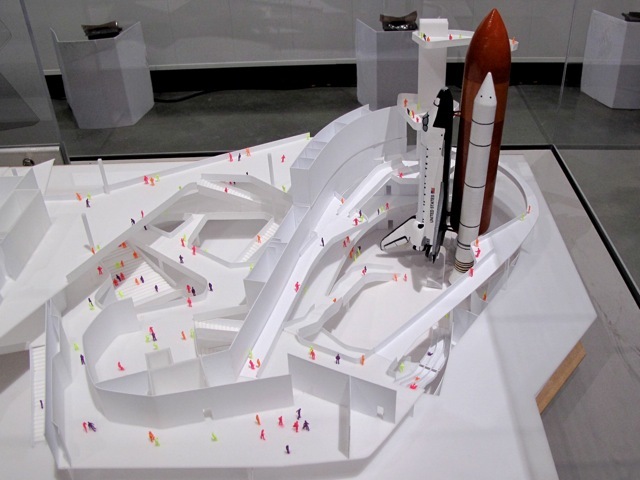 My kids (8 yrs and 10 yrs) focused in on the small ceramic tiles (23,000 in total) that cover the shuttle’s outer skin. This skin, called the TPS (Thermal Protection System), protected the shuttle from the scorching temperatures of re-entry into the Earth’s atmosphere (upwards to 3,000°F). Pretty amazing given that the tiles are very light weight, and so fragile you can crush them with your bare hands. The space shuttle will remain in a horizontal position until its permanent location, the Samuel Oschin Air and Space Center, is completed in 2017. In the Pavilion, we saw a model and plans for the new building which will be tall enough to install Endeavour in a vertical position with its external tank and twin solid rocket boosters, just like it was on the launchpad. When you see Endeavour, be sure to check out The California Story exhibition (located in the main museum building). 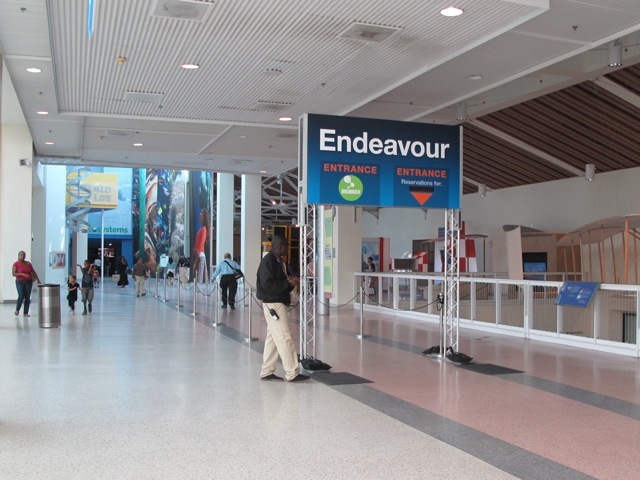 The exhibition documents Endeavour’s history and its strong ties to California — Endeavour, and all the orbiters, were assembled in Southern California. In the exhibition, you’ll see historic photos of Endeavour’s construction in the Downey and Palmdale aerospace facilities. 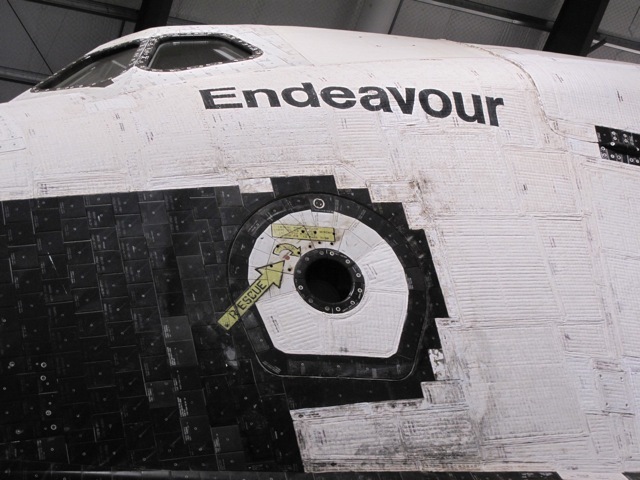 Learn about Endeavour’s 25 space missions, and see some of its incredible artifacts including the shuttle’s actual food galley (where they cooked up all those freeze-dried meals) and its bathroom. 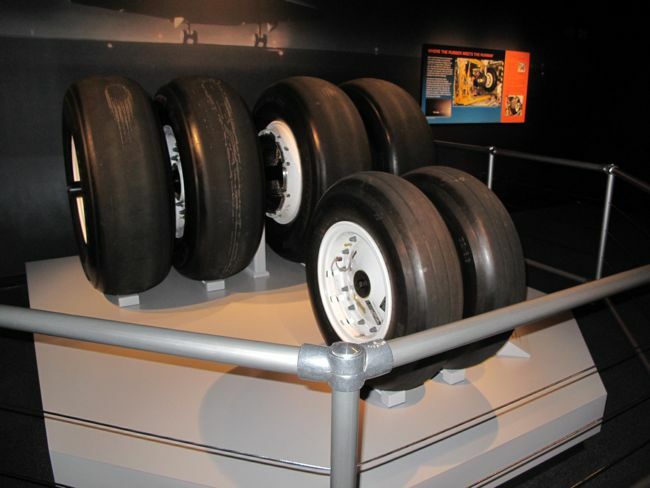 My 8 year old jumped at the chance to touch the tires used on Endeavour’s final mission touchdown on June 1, 2011. And to top it all off, the Hubble 3D movie about NASA space exploration just opened at the IMAX theatre at the California Science Center (click here to see trailer). The Endeavour exhibition at the California Science is a great family outing. I can’t think of a better way to introduce children to the fascinating science of space exploration. Welcome home Endeavour! 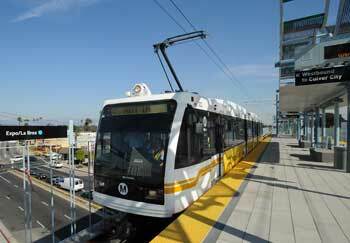 Hours: The California Science Center is open 10 am – 5 pm daily. Note the museum will be closed Thanksgiving, Christmas, and New Year’s Day. Tickets: You can get timed-ticket reservations for the Endeavour exhibiiton at the box office, but I recommend making advance reservations either online or by phone 213-744-2019. IMAX Theatre: Click here to check showtimes and buy tickets online for the Hubble 3D movie.